How Does Cutrine Plus Granular Control Algae? Most aquatic bodies of water degrade over time as muck levels increase. This rich bottom layer of sludge acts as a potent fuel source feeding growth and serving as a constant supply of phosphates and nitrates which directly stimulate the proliferation of algae. Year after year, organic matter such as grass clipping, leaves, branches, fertilizers and a dozen other organic matters deposit in ponds where they are slowly converted to nutrient and fuel rich sludge. In the old days, treating algae with pure copper crystals was the only option but came with a high price. Copper is a metal which does not degrade, decompose or breakdown and with each treatment adds unhealthy, or toxic, levels of copper sulfate to the ponds ecosystem. This unhealthy repetitive treatment process leads to a stagnant, dead pond that is extremely unwelcoming to plant and other aquatic life – including people! 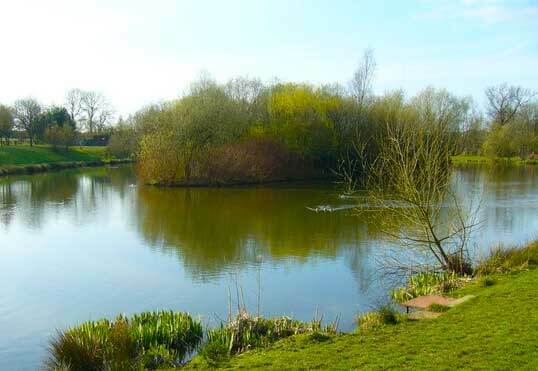 Year after year, repetitive copper treatments destroy the natural balance of the ponds ecosystem, killing off mass amounts of healthy bacteria present in all ponds which help keep muck levels suppressed. The excess copper kills down the bacteria colonies which allows for rapid muck development and loss of pond depth. Many people using toxic level copper treatments have lost a foot or more of depth each year due to the constant kill of ‘good’ bacteria in their ponds. Unlike unrefined copper sulfate, Cutrine Plus Granular is a double chelated copper which is much less toxic than CuSO4 and is highly effective at controlling and eliminating a wide variety of algal species. Since the granules are formulated as a double-chelate, Cutrine Plus stays in the water column longer providing a greater capacity for control compared to raw copper. Cutrine Plus Granular is the only patented copper algaecide on the market today and is by far the most popular and most effective algae control treatment for submersed algae available. Controlling algae doesn’t have to mean that you pond has to suffer a slow toxic death. Use Cutrine Granular – a safer, eco-friendly algae control treatment designed with sustainability in mind. Each 30 lb bag of cutrine granular will control 1/2 acre worth of subsurface algae. The slow release granulars are spread out like fertilizer along the shallow areas to keep bottom growth at bay. AlgaeGuy on How Does Cutrine Plus Granular Control Algae? Cutrine Plus Granular Copyright © 2019.